My general reaction so far to the Wes Anderson films I’ve seen is lukewarm. Moonrise Kingdom and The Grand Budapest Hotel were alright, with most of the appeal for me coming from Anderson’s distinct visual style. Fantastic Mr. Fox is the sole Anderson film that I unreservedly enjoy – there’s his style, which is the same, but the difference I found was it meshed so well with the specific story and the stop-motion medium. With The Royal Tenenbaums, Anderson’s third film after Bottle Rocket and Rushmore, it seems to hit all of my least-favorite qualities of his films. Even the visual style, much the same as the others I’ve seen – I mean, there’s no mistaking an Anderson film – for some reason didn’t click this time ‘round. 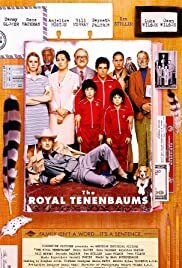 The main reason I think is that the story of The Royal Tenenbaums fell flat for me, and the story impacts the visuals here, but it also wasn’t as distinctive as a film like Moonrise Kingdom. I found the sets to be quite bland, nothing at all memorable about the main house (mansion?, mixed-use residential/commercial property?) where the Tenenbaums live. All the colors were very muted (a big contrast to the previous films I listed) which led to it being depressing, to be honest. Depression seems to be a recurring theme in the film – as depicted by Richie Tenenbaum’s (Luke Wilson) spoiler, but the impact of that went straight over my head. I got it (I think), but it wasn’t done well. Which, speaking of the story, I also found to be blah. Alec Baldwin’s narration did a decent job with the prologue to the story, but soon after, pretty much as soon as “Chapter 1” began, my interest plummeted. The Tenenbaums are clearly developed and complex, but I didn’t care for them. Richie and Chas Tenenbaum (Ben Stiller), and Margot (Gwyneth Paltrow) – their adopted sister – have distinct traits, but their personalities are homogeneous. I couldn’t follow what was important in the story, besides depression (seemingly) what any of the themes/point to the film was, and otherwise get myself invested in a single storyline. The closest I came was when the father, the eponymous Royal Tenenbaum (Gene Hackman), takes Chas’s two kids out for mayhem around the town. It was goofy, reckless, and irresponsible. Combined with these characters, it was funny. The only time in the film I laughed was during this sequence and I thought, “Here we go, I’m finally getting into this film about halfway through,” but nope, downhill immediately after. It’s disappointing to me that I seem to miss the enjoyment and appeal of Wes Anderson films that so many others seem to get. With each of Moonrise Kingdom and Grand Budapest, they were decent enough that I remained hopeful I would eventually find the key into Anderson’s mind. Fantastic Mr. Fox made me even more optimistic as I finally found a film of Anderson’s I would want to watch a second time. But The Royal Tenenbaums makes me want to give up trying. I may still give his recently released Isle of Dogs a throw, though it may not be as similar to Fantastic Mr. Fox as I’m hoping, but Rushmore… The Darjeeling Limited… I think those are losing their place on my “to-watch” list.